Riding The Carousel, originally uploaded by Lukasmummy. 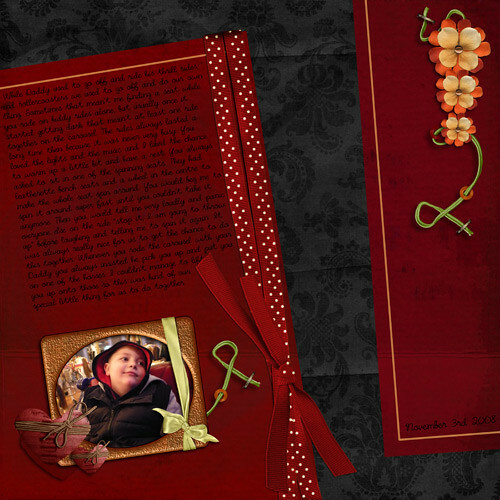 Credits: Layered template (Designer Survivor, Catch The Ship Template) by Jen C Designs and Naturally Yours Mega Kit contributions by Jaime Rhinehart (Cjoy2Day Design), Tamara van Wijk (TotallyD Designs), Robyn Littlejohn (Red Dog Designs), Gabby Palmer, Scrapberry Designs and Lucie Battaini (Lucie B Designs). Font is CK Letter Home. Journalling reads: While Daddy used to go off and ride his thrill rides, and rollercoasters we used to go off and do our own thing. Sometimes that mean’t me finding a seat while you rode on kiddy rides alone, but usually once it started getting dark that mean’t at least one ride together on the carousel. The rides always lasted a long time then because it was never very busy. You loved the lights and the music and I liked the chance to warm up a little bit and have a rest. You always asked to sit in one of the spinning seats. They had leatherette bench seats and a wheel in the centre to make the whole seat spin around. You would beg me to spin it around super fast until you couldn’t take it anymore. Then you would tell me very loudly and panic everyone else on the ride “stop it, I am going to throw up” before laughing and telling me to spin it again. It was always really nice for us to get the chance to do this together. Whenever you rode the carousel with your Daddy you always insisted he pick you up and put you on one of the horses. I couldn’t manage to lift you up onto those so this was kind of our special little thing for us to do together. Autumn Leaves, originally uploaded by Lukasmummy. 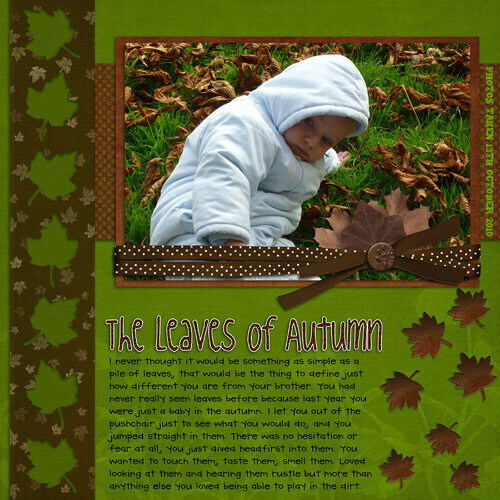 Credits: Layered template (Autumn Templates, Template 2) by Juliana Gordon, Naturally Yours Mega contributions by Gabby Palmer, Sandra Collins (Creations By Sandy), Melissa Robinson (Melly Scraps), Denise Tilley (DigiDesigns By Denise), Jaime Rhinehart (Cjoy2Day Designs) and Lucie Battaini (Lucie B Designs) and October Mystery Collab Glitter Styles by Jewel Goodwin (Mad Genius Designs). Fonts are CK Handprint and CK Mapped Out. Journalling reads: I never thought it would be something as simple as a pile of leaves, that would be the thing to define just how different you are from your brother. You had never really seen leaves before because last year you were just a baby in the autumn. I let you out of the pushchair just to see what you would do, and you jumped straight in them. There was no hesitation or fear at all, you just dived headfirst into them. You wanted to touch them, taste them, smell them. Loved looking at them and hearing them rustle but more than anything else you loved being able to play in the dirt. Bump Photos, originally uploaded by Lukasmummy. 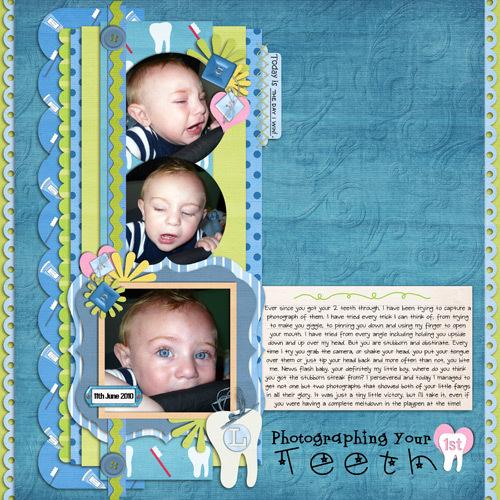 Credits: Layered template (Cindy’s Templates Set 52, Template 2) by Cindy Schneider and New Beginnings by Jen C Designs. Fonts are CK Mapped Out and CK Ashleys Alpha. Journalling reads: When I was pregnant with Logan, I was so thrilled to have a real little baby bump. I was intending to take bump photographs and scrap my pregnancy journey since we knew my body couldn’t take another pregnancy. But nothing went to plan. I felt so ill all the time, that we only managed this one set of pictures.